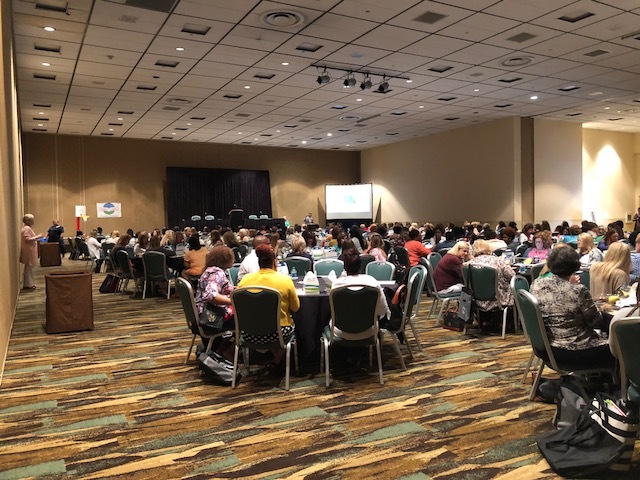 Members of the BRI team hosted a special Lunch & Learn session during the Mississippi Department of Education’s Third Annual Literacy Coaching Symposium to launch the Reading Universe website to hundreds of educators and administrators from across the state. Dr. Michael Cormack began with a brief video of the various programs and professional development opportunities available through the Institute. Then through a very entertaining analogy, he explained that similar to the way the “Granny Shot” improved the free-throw accuracy of NBA legends saying, “We hope the Reading Universe website will be our ‘Granny Shot’” for increased accuracy in areas of early literacy. Marion McBride, BRI’s Director of Program Design, followed Michael, explaining the different components of www.ReadingUniverse.org, highlighting both the Simple View of Reading and the 5-for-5 model present on the Reading Universe Grid. Marion’s presentation included a lively scavenger hunt and basketball shoot-out where participants were able to interact with the Reading Universe Grid to correctly answer questions for the chance to win BRI paraphernalia. Throughout the presentation, cheers of excitement could be heard as educators learned of the vast resources that are offered on the website. There were several times where audience members applauded when learning about the assessments, activities, and exemplar lessons readily available for FREE!